Lamentation for trusting in wealth rather than trusting God. Songs for the Amos passage also fit here. 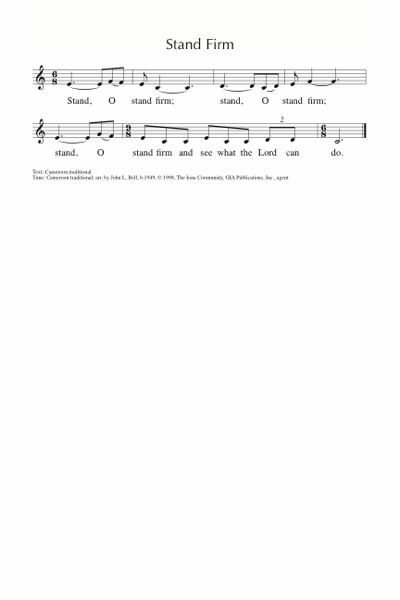 NCH Psalter Trust in the steadfast love of God for ever and ever (Marshall) A very simple refrain with a cantored or read Psalm. *AoV2-055 / G(II)513 / GC711 / GC(II)716 / G(3)806 May we find richness / Harvest of Justice “Gather with patience for those who have nothing. Leave them your riches, and you will receive.” Sample sheet music, lyrics and a plodding tune sample. *Emergent Psalter I am like an olive tree (Everett) A modern, intuitive peaceful refrain. I just love this one. Sheet music sample. PfAS052B But I am like a green olive tree (Miller) Simple Psalm refrain. 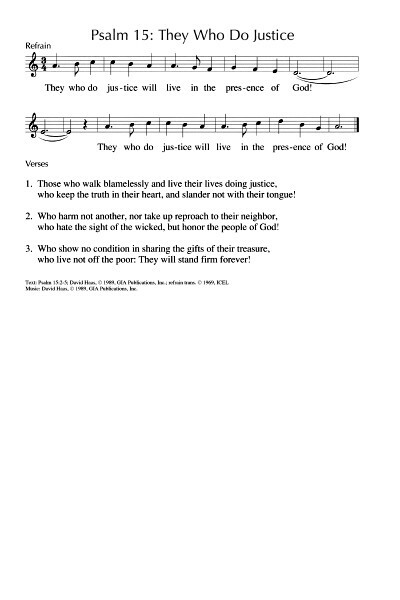 PfAS052A You cunning liar why publicise (Bell) Very strong lyrics calling for God to bring justice, and for strength to those who call for it. PfAS002 Tree of wisdom fruitful green (Morgan) Easy to sing, since it's set to DIX, and lovely words based on the Psalms, including this one. New words to old tunes. Online Resource Why do you boast? 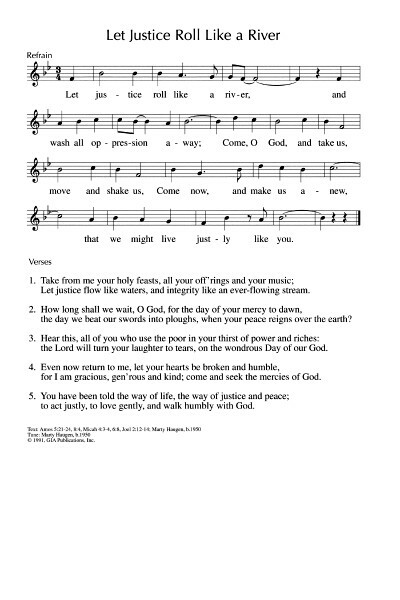 (Gay) New lyrics by Doug Gay that pick up some of the trickier themes of this Psalm. Set to the tune BACA, but would fit other 88.88.8 tunes. I quite like ROLLAND. Lyrics (Facebook). New words to old tunes. *VU575 / SFFS 2153 / GtG700 / PH369 / SP&P139 / W&R574 / Cha614 I'm Gonna Live So God Can Use Me (African American traditional) Good simple tune and meaningful words. Easy to sing and play around with. Good for kids, non-readers and for people for whom English is a second language. Alternatively: PfAS015C I'm Gonna Live So God Can Use Me (African American traditional) A version of the same song, used as a Psalm refrain. Good for kids. Some nice Christology “image of the invisible God, first-born of creation…. all things created through him and in him”. Reconciliation through Christ’s death, our lives as witness, Christ as Paul’s inspiration and energy. TiS 688 Come to be our hope O Jesus (Marachin) This is a really fun Latin American song from the World Council of Churches Assembly in Canberra. It's not easy the first time, but once you've heard it, it's very catchy. The words are really excellent, despite a slightly clunky translation. It would be worth teaching to your congregation! 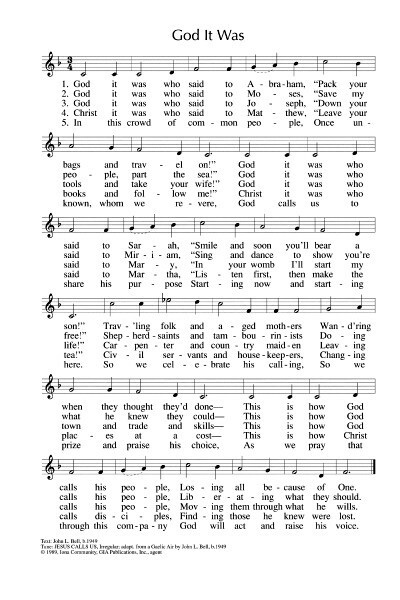 We sang this a couple of times during Advent. BUC Song Project Love is the Power (Anderson). Suggestion for the congregation at Brunswick as this is not published yet. It's a little bit tricky. TiS 617 / NCH413 / UMH517 / WoV736 / ELW626 / A&M605 / GtG818 / PH342 / W&R75 / 82Hml-695 / Lau428 By gracious powers so wonderfully sheltered (Bonhoeffer / Pratt Green) Wonderful words by Bonhoeffer. Lousy tune. Words fit well to O Perfect Love if you find the tune too tricky. 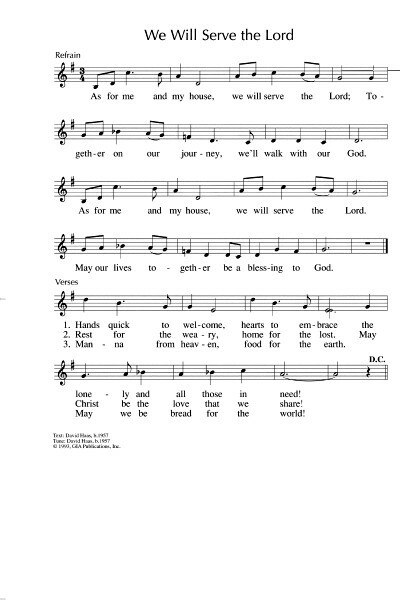 Can also be sung to BERLIN or INTERCESSOR. 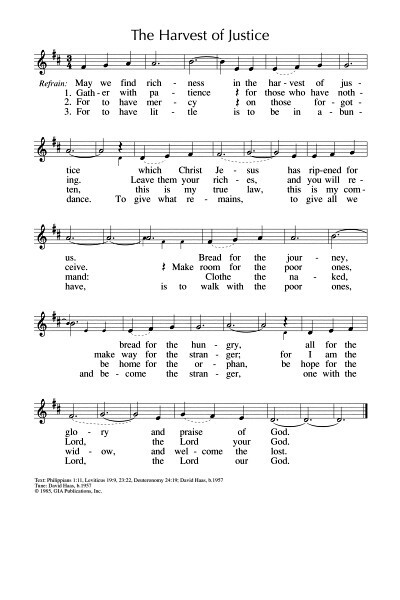 The 5th verse is omitted in some hymnals. Lyrics. New words to old tunes. TiS 691 Faith will not grow from words alone (Smith) Excellent strong words of a questioning faith to a familiar hymn tune. Gospelling to the Beat One man was Peter he lived by the sea (Llewellyn) A simple kid's song "stop what you're doing and follow me" Good for kids. Liturgy for the Whole Church p153 Martha and Mary (Bock) A dramatic reading for two women. Unusual Resource When Jesus went to Bethany (Smith) Great words to a familiar tune (TALLIS CANON) From the book "Songs for a hopeful church". New words to old tunes. Voices Found / Online Resource In Boldness Look to God for Help (Bringle) Excellent new words to the familiar tune MORNING SONG. New words to old tunes. Lyrics and sheet music sample. Thanks to Sunny Hallanan for this suggestion. Online Resource Matthew was a lonely man (Gibson) Good words about Matthew, Thomas, Martha and Peter, and how they each found a friend in Jesus. Good for kids. Lyrics and sheet music. Thanks to Trisha Daniell for this suggestion. What ideas do you have? I would love to hear your ideas - please add a comment below. Written in Cullman Alabama, after the Cullman County Courthouse All-Day Singing.